I recently got into a healthy habit of dedicating every late afternoon during my visit home to power-walking inside Lumpini Park, the Bangkokian smaller (and hia-infested) equivalent of Central Park, with my best friend T and his girlfriend K. It’s funny how regardless of whatever we discuss while huffing and puffing (mostly on my part), the conversation inevitably slithers into fooddom; I guess that’s bound to happen when people who are deeply interested in food get together. The idea for this post, for example, was generated by K during one of our breathless, sweaty walks. We had just finished discussing Kaeng Som when T’s eyes wandered towards our favorite young coconut vendor1 just outside the park gate and K brought up something I thought was interesting: fish sauce stir-fries. Not among the type of people who order home-style stir-fried vegetables when eating out, I hadn’t noticed the trend. But K’s right: the down-home dish that we grew up with, the one we’ve taken for granted and abandoned for the more complex version of the same thing, is back. And if the current going menu prices mean anything, it’s back with a vengeance — screaming, “I’m not gonna be ignored!” in the style of Glenn Close’s character in Fatal Attraction. With K’s home life growing up pretty similar to mine, we both are puzzled by this unlikely phenomenon of a dish being elevated to a height it had never before seen — not that it’s a bad thing. You see, until recently, this is the type of dishes that are usually found at home or rice-curry shops (and school cafeterias) all over Bangkok which typically offer home-style dishes that people don’t want/have no time/don’t know how to make at home. A stir-fry of “lowly” vegetable like cabbage flavored simply with nothing but fish sauce has never been a fancy restaurant or posh café thing. In fact, if you went to a high-brow Chinese restaurant, a lao (เหลา), back in the days, you’d often get the kind of Thai-Chinese stir-fries that feature sauces similar to Bruno. I can testify to this; I grew up in the era when every flippin’ thing stir-fried Chinese-style with oyster sauce was so special and something worth going to a restaurant for, whereas simple stir-fries with fish sauce were, as you Americans like to say, nothing to write home about. This could be because — to take the expression a bit too literally — it’s kind of awkward to write home about something you normally find at home. But for those of you who didn’t grow up eating this at home for breakfast (yes), lunch, and dinner, this is something you definitely want to write home about. Employing only four ingredients (water doesn’t count) — five if you want to add some meat to it — this stir-fry is as simple as it is nourishing. Before you write it off as too ordinary, give this a try. Serve this with rice and have a little bowl of nampla prik nearby. There are more things that have come up during my conversations with T and K. I’ll report them to you in due time. Cut the cabbage into eight equal wedges and core each wedge, separating the leaves (see the first picture). Alternatively, to make it easier to eat, you can also quarter the cabbage, core each quarter, and slice it into 1/2-inch strips (see the third picture). 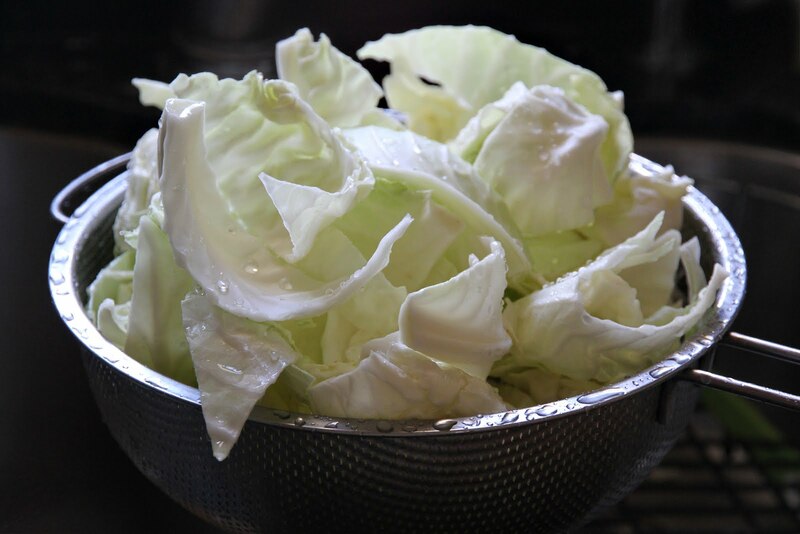 Wash the cabbage and shake off all excess water; set aside. Set a large wok over high heat. Once the wok is hot, add the oil and minced garlic at the same time; stir it around constantly. If you want meat in this, add the meat to the wok once the garlic is fragrant and turning light brown in color; stir. When the meat is done, add the cabbage, fish sauce, and water; stir until the cabbage is cooked to the desired texture (I like the cabbage somewhat crisp, as you can see in the top picture). 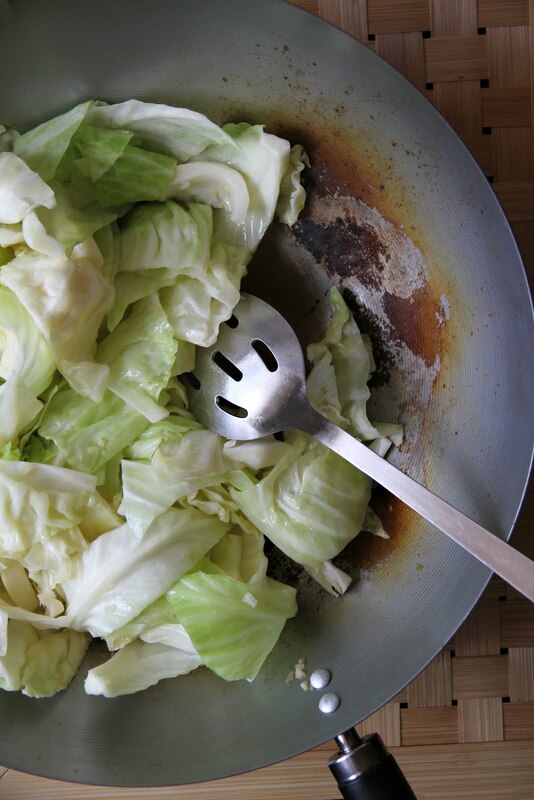 If you don’t want meat in this, simply add the cabbage to the wok after the garlic becomes light brown and fragrant, followed by the fish sauce and water; stir until the cabbage is cooked to the desired texture. 1 “Young” here modifies “coconut,” not “vendor.” The coconuts are young; the vendor — not so much. Nice kitty kitty – yikes! In the Philippines we call this Guisado, my fave is Cabbage cooked roughly this way too. We put pork bits, crisped and shrimps. We pound the head and shells in a mortar and use the juice for added flavor. Glorious. Believe it or not, the Viet has a similar dish like this too. But we tend to add one or two tomatoes in the mix. Your footnote made me giggle. If I were an American book editor (I’m a designer, but a word nerd), I’d probably edit your sentence with a hyphen, making “young-coconut” a compound adjective, and eliminating confusion. Sadly eliminating confusion would also eliminate your funny footnote. And I love a funny footnote. Your blog is a constant inspiration — and source of delicious food, in this house. Big fan, reading as much as possible at bed time each night. I will read every …single…blog. I am learning a lot despite the fact that I am Thai and my family cooks ah-mazing food! Needless to say, they do the cooking, I do the eating. But I’m slowly learning…. oh my god. YES YES YES. 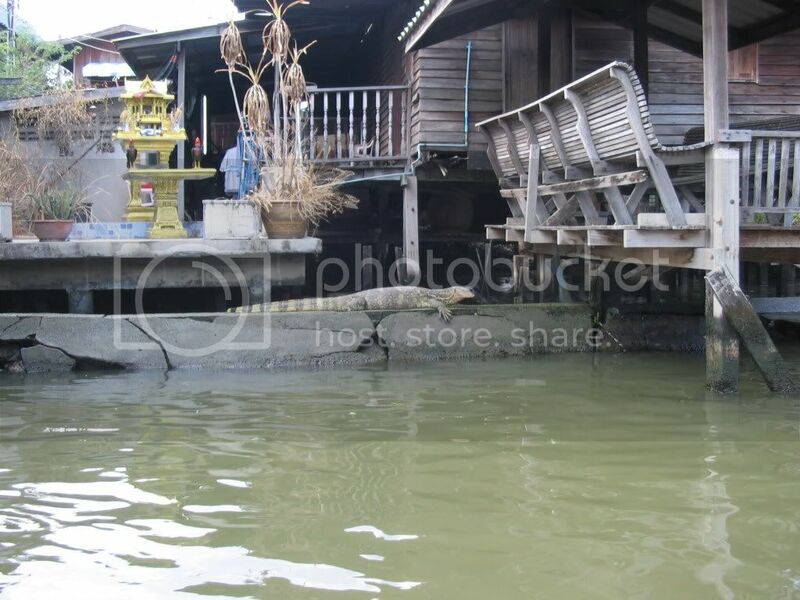 i lived in thailand for a year as a rotary exchange student and desperately miss the food. this humblest of simple dishes was one of my Top Three favourites. so very, very happy to have found this website! this humblest of simple dishes was one of my Top Three favourites. so very, very happy to have found this website! I am learning a lot despite the fact that I am Thai and my family cooks ah-mazing food! Needless to say, they do the cooking, I do the eating. But I’m slowly learning…. AWWW….I had NO idea this was a Thai favorite! 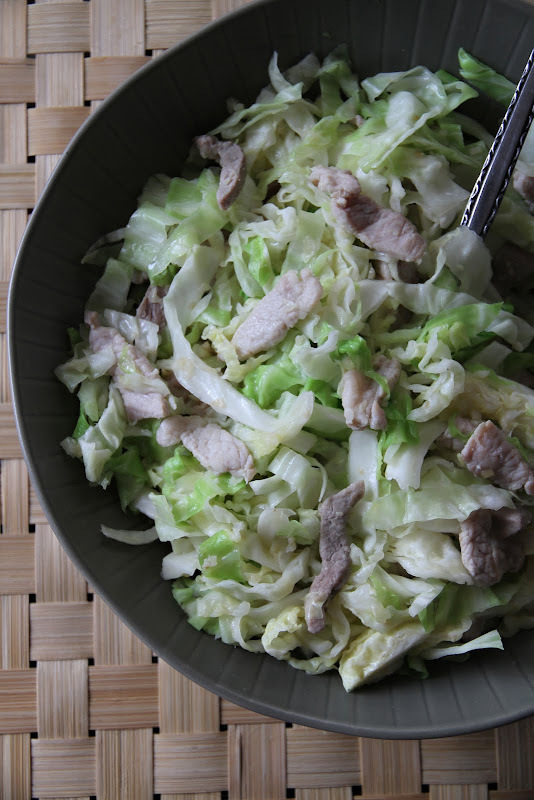 I just love cabbage in ALL its forms, and started stir frying it because I just couldn’t wait! What a magnificent vegetable cabbage is, so totally healthy, and so insanely delicious! Thank you for this version! I have searched high and low for “THE” Thai fried rice recipe….. I bought microwavable Thai style fried rice with mushrooms, made by mishima…..INSTANT addiction! it is so wonderful! I have to order it and it ain’t cheap, have been obsessed with trying to reproduce the flavor in my kitchen….do you think its cause I live in Oklahoma and my stove just can’t understand “Thai”……..anything! lol! Nelda, I’ve looked at the product you’ve mentioned online and I can’t think of one thing in the Thai repertoire that might help you recreate that. I could share a recipe for what I consider to be Thai-style fried rice as it’s served in Thailand, but it won’t give you the result you’re looking for. For a product (such as this one made by a US company specializing in Japanese food, if I’m not mistaken) that has the word “Thai” on it without having any discernible characteristics of any classic Thai dish, the best way to replicate the recipe is to look at the ingredient list on the package and go from there. I made this dish last night with dried shrimp for the meat, and it was good. My wife, who had taught aerobics, was trying to show me a great corned beef sandwich and was confused that I had no interest at all in the sandwich, as I was happy with the taste of the stir fry. Would you serve this with sticky rice, jasmine rice, or either? I just got your book, and am really enjoying it – to the extent that I just ordered an outdoor wok burner! My electric cooker is just not up to wokking. I really miss having a gas cooktop, but now we live in a hurricane zone, I admit that electricity is a bit safer. Yes, I’d love to see a post on pairing foods with rice. And also on realistic meal planning when you’re cooking for one or two people on a regular night, as opposed to “party” nights. The fundamental problem is that there aren’t enough mealtimes in any one day!